What a first week at the Aussie Open! Last Thursday night, one of the great recent rivalries of men’s tour was reignited on Rod Laver court. It was the battle of the two former number ones. 15th seed American Andy Roddick was taking on wildcard Lleyton Hewitt, for the 14th time in their careers. Roddick had won the previous six matches between the pair. 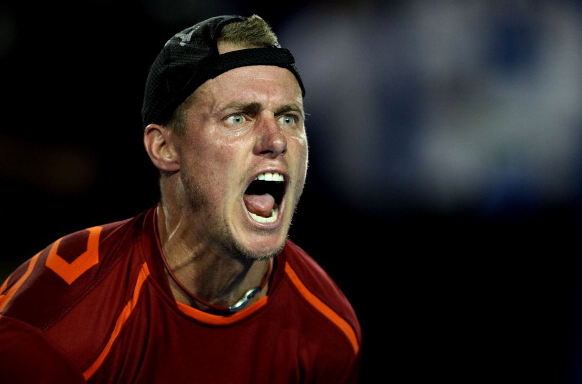 Both players were prominent forces 10 years ago where Hewitt held the number one ranking in 2001 and 2002 for a combined total of 80 weeks, during which he won Wimbledon and the US Open. Andy Roddick was ranked top dog for 3 months in 2003, following a US Open win (his sole major triumph). The careers of the Australian and American have been similar, Hewitt leads in the major wins but Roddick has been a losing finalist four times compared to Hewitt’s two. In addition, Roddick has reached 5 semi-finals shading Hewitt’s four. Roddick though, has consistently been around the world’s top 10 for the entire decade whereas Hewitt, since 2006, has steadily plunged down the rankings (currently ranked at 181 in the world) thanks to a combination of injuries and poor performances on the tour. However, both players have accumulated $20m USD (thanks to Hewitt’s form in the early ‘00s) in career prize money to date so don’t feel too sorry for them. On Thursday night, they both threatened to roll back the years on centre stage with some great rallies and dogged performances. However when Hewitt, to the delight of the crowd, went 2-1 up in sets it signalled a withdrawal from American sighting a hamstring injury. This was a massive disappointment to the crowd and the fans watching back at home. Both players have the right to curse Roger Federer. Just when they started dominating the men’s tour Federer, undoubtedly, moved tennis into a new era and beyond their reach. 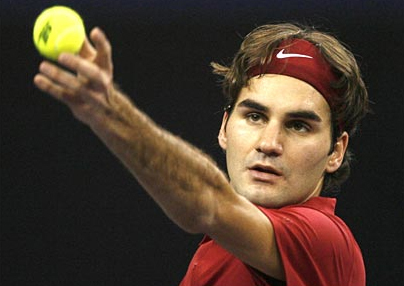 After all, based on Grand Slam wins (16), Federer is the best of all time. Pete Sampras, though, still holds the record for total number of weeks placed at number one with 286. Federer is at 285 weeks, so the record is very close. Without a doubt Federer is eager to reclaim his number one spot and adding the Australian Open would be a significant step in the right direction. 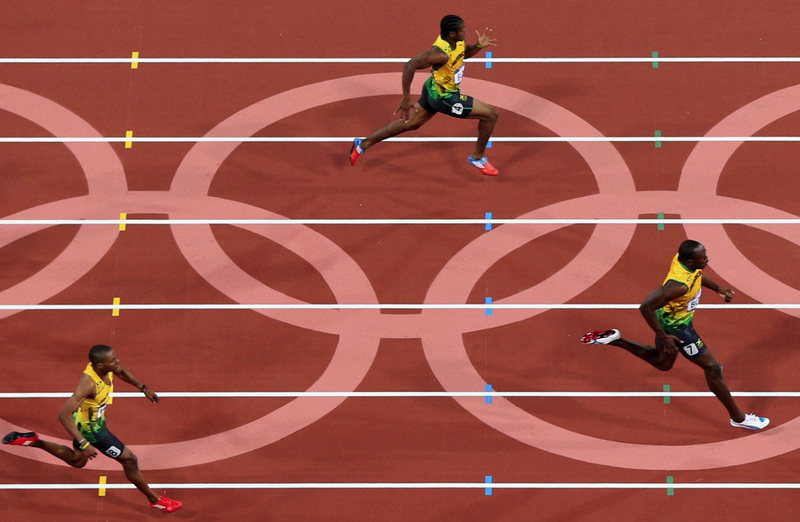 The Fed-express has largely swept everyone aside so far in the tournament. However his number 3 seeding means the opponents will start to become much tougher now. The match against local hero Bernard Tomic last night was never really in doubt resulting in a comfortable victory for the Swiss. A mouthwatering quarter final tie against rejuvenated Juan Martin del Potro now awaits him on Tuesday which must not be missed. Bernard Tomic has demonstrated to the public that he is not a million miles away from breaking into the world’s top ten in the future. The 19 year old youngster has proved that he is a marathon man with two 5-set wins and one 4-set win in his first three rounds last week. Winning his first round encounter, after being two sets down, against Fernando Verdasco was a great achievement in its own right and after beating 16th seed Dolgopolov on Friday night his belief and self-confidence would have gone up a few notches. There’s no doubt that the young Australian has a bright future ahead of him. James Duckworth too, is worthy of a mention. The 19 year-old Sydney-sider had to qualify to get into the Australian Open and swept aside a fellow qualifier, Jurgen Zopp, in a straight sets first round victory. James has good tennis genes as his grandmother, Beryl Penrose, won the Aussie Open singles and doubles in 1955. ‘The Duck’ performed valiantly in the second round but unfortunately lost out against 9th seed Janko Tipsarevic from Serbia who, in turn, was eliminated in the 3rd round following a straight set loss to Frenchman Richard Gasquet. Along with Andy Roddick, Gael Monfils became another high profile victim of the Open this week, with the Frenchman going down in five sets to Kazakstan’s Kikushkin. 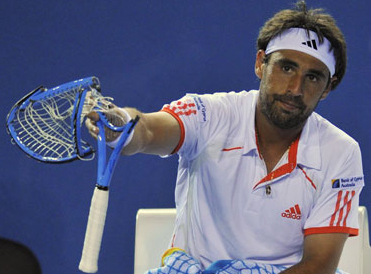 Marcos Baghdatis’ cookie monster outburst gave the travelling Greek and Cypriot supporters a little cheer in otherwise another poor outing from the former finalist. Expectedly, the top two seeds in Djokovic and Nadal have marched into the second week of the Open in total dominance without dropping a set. Djokovic faces Hewitt tonight. Andy Murray, twice a finalist in Melbourne, has played better with each game and will face Tsonga in the quarter finals on Wednesday, should both players advance in their respective 4th round matches today. Another tie not to be missed. Similarly in the ladies games, top two ladies seeds, Caroline Wozniaki and Petra Kvitora, are ploughing through their opponents, lusting after that prestigious number one spot. Wozniacki is chasing her elusive first major tournament win whilst Kvitora knows that a win Down Under will push her very close to the number one ranking. Meanwhile, number 3 seed, Victoria Azarenka is screaming herself to victory in each round. At first it’s entertaining but then it becomes downright annoying and the crowd has already vented their anger during her matches. Maybe we should get her and Marcos Baghdatis into a sound proof room. The hot blooded Cypriot can go to town with Wilson’s finest collection of graphite rackets whilst the wannabe Czech opera singer can soprano until her heart’s content. I’m sure there will only be one winner there. Speaking of screamers, Maria Sharapova and Serena Williams are also advancing well. Last season’s finalists met yesterday in the 4th round with China’s Li Na facing defending champion and adopted Aussie Kim Clijsters. Both players had started the tournament in formidable form so it was a shame to see one of them eliminated before the second week of the Open. Li Na took the first set. After that Clijsters put in a heroic performance as she saved four consecutive match points on her way to winning the second set tie break and triumphing 6-4 in the deciding set. All with a sprained ankle too. 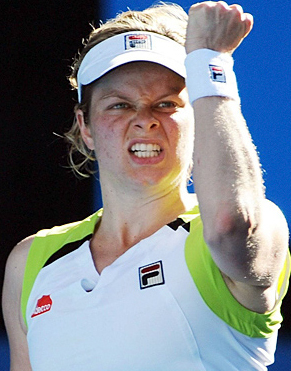 Clijsters ‘ rewards for her solid effort is facing Wozniacki on Tuesday. Spare a thought for reigning US Open champion Sam Stosur who fell at the first hurdle against 21 year old Romanian Sorana Cirstea. Stosur looked in trouble from the offset as her Romanian opponent pulled out a collection of wonder shots making life more than difficult than experts predicted. There were high expectations of the Aussie to perform in front of her home crowd but it was not to be. Welcome to the business end of the Aussie Open. Will there be any surprises?